I've been a delinquent blogger this past month, yet again. I now have my computer back, so that's no excuse, but I have been working full time (no summer holidays here!) and then painting and moving when I haven't been working.... so, within a week, once all of our moving is finished, I'll post some before and after photos of what we've been doing with our new upstairs apartment this month. In the meantime, here's a photo to show you how much Izzy enjoys living upstairs with the windows. 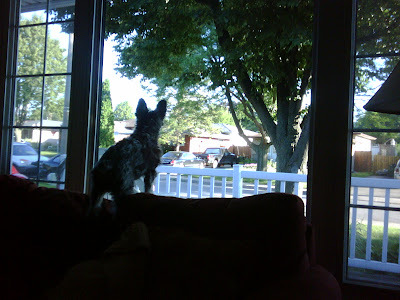 This morning, she was watching a squirrel running around in the yard and up and down the tree. It was a very exciting morning for her. And yes, that's our couch that she's standing on.